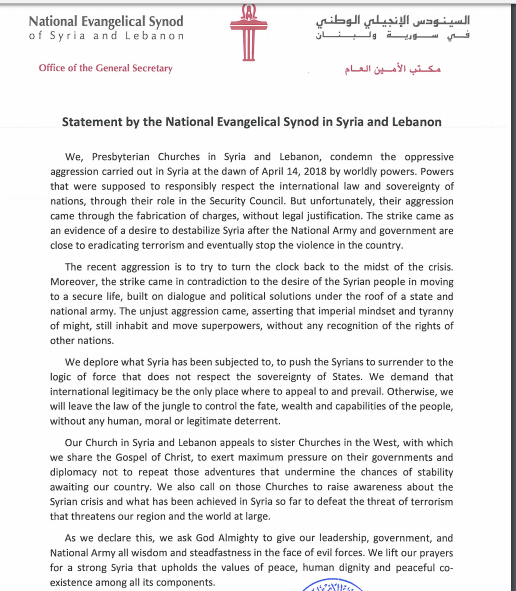 The Patriarchates of the East and the Evangelical Synod of Syria and Lebanon have both issued statements condemning bombing of Syria by the USA and allied forces of Britain and France. This bombing was in response to a chemical weapons attack. 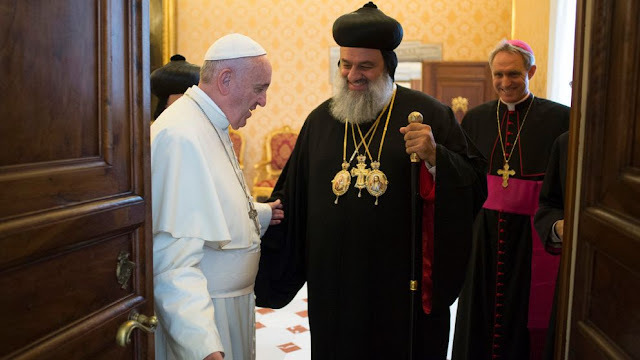 A statement signed by John X, the Greek Orthodox Patriach of Antioch and all the East, Ignatius Aphrem II, Syrian Orthodox Patriach of Antioch and all the East, and Joseph Absi, Melike-Greek Catholic Patriarch of Antioch, Alexandria and Jerusalem explains that they 'condemn and denounce the brutal aggression'. A similar statement has been issued by the National Evangelical Synod in Syria and Lebanon. It says the strike was the result of 'the fabrication of charges, without legal justification' and was 'in contradiction to the desire of the Syrian people'.